Bring a little more color to your ride! In case you hadn’t noticed, we believe in color. While conventional blacks and browns might be perfect in some settings, we think every day rides should be a little more…fun. That’s why we offer our stirrup leathers in the same colors as our halters and bridles – from reds to lime greens to pinks, add a pop of color to your saddle. If you haven’t worked with beta biothane, it’s smooth to the touch and very soft, so it won’t rub your leg or your saddle. They also don’t stretch like conventional leather. So what are you waiting for? Give ’em a try. Our monthly tack giveaways are one of the most popular features on our Facebook page (which you should really follow, by the way). We’re pleased to announce that a horse named T-Bird and his human, Bethany, are the winner’s of last month’s contest for a two-color traditional halter bridle. T-Bird is a 15-year-old Percheron/Quarter Horse cross and lives with Bethany in Las Vegas. We love paints, and T-Bird is especially flashy with his tall stockings. “He has brought me much joy over the last couple of years, and I hope to spend many more days watching this majestic animal,” Bethany told us via email. We hope T-Bird and Bethany enjoy their new traditional halter bridle. As draft cross fans ourselves, we know that horses like him can be tough to fit. That’s why we offer all our tack in your choice of seven different sizes, including Warmblood and Draft for bigger fellas like T-Bird. If you’re concerned that your horse falls between sizes, leave us some info about the horse’s age, breed, height and weight in the order notes section at checkout and we’ll modify the order to your horse’s needs. Our experienced tack makers have seen just about everything and know how to modify an order to work for your horse. What are you waiting for? Begin creating your custom tack creation today! We love meeting fellow riders, especially those who dabble in different disciplines from our own. That’s a big part of why we do our regular tack giveaways, both the monthly giveaway on our website and the giveaways exclusive to blogs run by fellow horsemen and women. This week, we’re sending congratulations out to Kathy and Pincel de Color, a 7-year-old Paso Fino. “Pincel de Color” means “brush of color” in Spanish, and we think it’s a beautiful name. Kathy and Pincel are readers of the Endurance Granny blog, as endurance competitors themselves. They have completed two 30-mile rides and one 50-mile ride. They also do competitive trail riding, pleasure ride shows, team penning, and hunter paces to see what discipline they like the best. Kathy and Pincel won a custom two-color halter bridle with bit hangers. The halter bridle makes it easy to go from trailer to trail with the addition of a couple of straps on the cheepkieces and a snap-on browband. Best for endurance and trail riders, the two-color halter bridle is made from beta biothane, which is super lightweight and waterproof, which makes it low-maintenance. Love the halter bridle concept? Pick up your own. Congratulations to Sue and Reba! We’re pleased to congratulate Green Been Endurance blog readers Sue and Reba on their win in our recent tack giveaway on Green Bean! Reba is a 17-year-old Arabian/Saddlebred cross who is better known on the endurance circuit as Faden Gazad. Sue says that Reba is happy to tote anyone around on her back, from young children to adults. 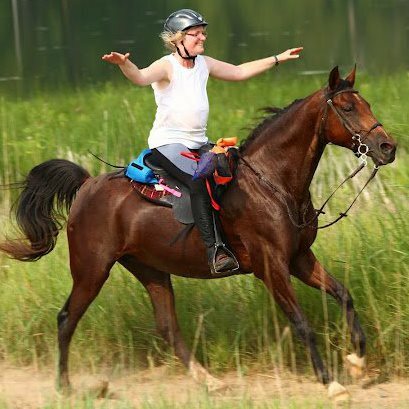 Reba and Sue compete in the Limited Distance division and recently attained their 500-mile medallion from the American Endurance Ride Conference, which is a great accomplishment. They go to several local endurance events each year near their home in Beldenville, Wisc., and were honored to pick up a Best Condition Award at one a few years back. Sue and Reba have won a traditional halter bridle with bit hangers. This is an awesome item for endurance and trail riders because it just takes a couple of quick additions to go from trailer to trail. It’s not only convenient, it solves some safety concerns with swapping tack out in the open. This is a two-color halter bridle made from beta biothane, which is easy to clean, pliable, and super light—a great perk for eventers like Reba. Sue and Reba’s hard-earned medallion. We are impressed!
. And add the Green Bean Endurance Blog to your weekly reading list! If you’re like us, you probably spent at least part of this weekend watching a patriotic parade down Main St. It’s hard not to get in the spirit of July 4th watching all the red, white, and blue flying around. Did you know you can also help make your pony a little more patriotic? 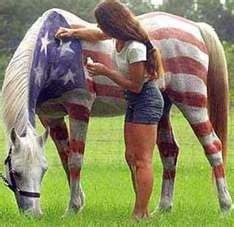 We loved these images (found via Pinterest) of horses decked out for the fourth of July! 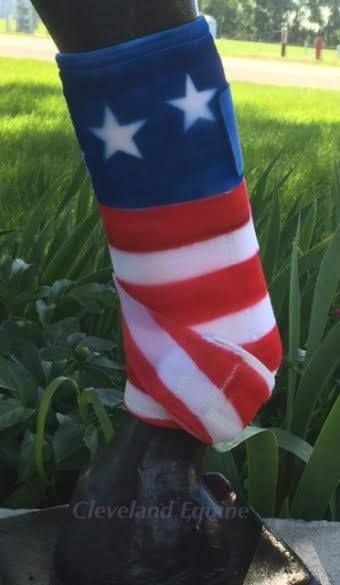 Feeling like dressing your horse up for the next fourth of July (or looking ahead to a Veterans’ Day or Memorial Day parade)? We can help. Just about all our beta biothane products come in two-color options so you can pick both a base color and an overlay (We think red base with dark blue overlay looks amazing). Our bling tack also comes in your choice of colors, and one of the options is red/white/blue like this breastcollar–a nice way to bring some subtle patriotism to your horse’s ensemble. What are you waiting for? Make your tack your own. It’s time for our July giveaway! A new month has begun, and that means it’s time for a new giveaway. This month, we’re giving away a single-color Australian barcoo bridle. 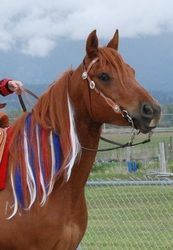 Also known as an outrider bridle, this style has no noseband and features a ring connecting the cheekpieces, browband, and throatlatch. The rugged style really lets the beauty of your horse’s head shine through. This beta biothane bridle is 3/4-inch wide and hand-stitched throughout for added depth and durability. You choose the size (mini – draft available) and the color from our selection of 14 hues. As with all our giveaways, we don’t require that you share the giveaway page like crazy or clog up your friends’ inboxes with it (although we do think they’d love to hear about it)–just fill out the contact form so we can reach you if you win. Even better, we’ll give you a $5 off coupon just for entering the contest…even if you’re not the winner. What are you waiting for? Click here to enter.